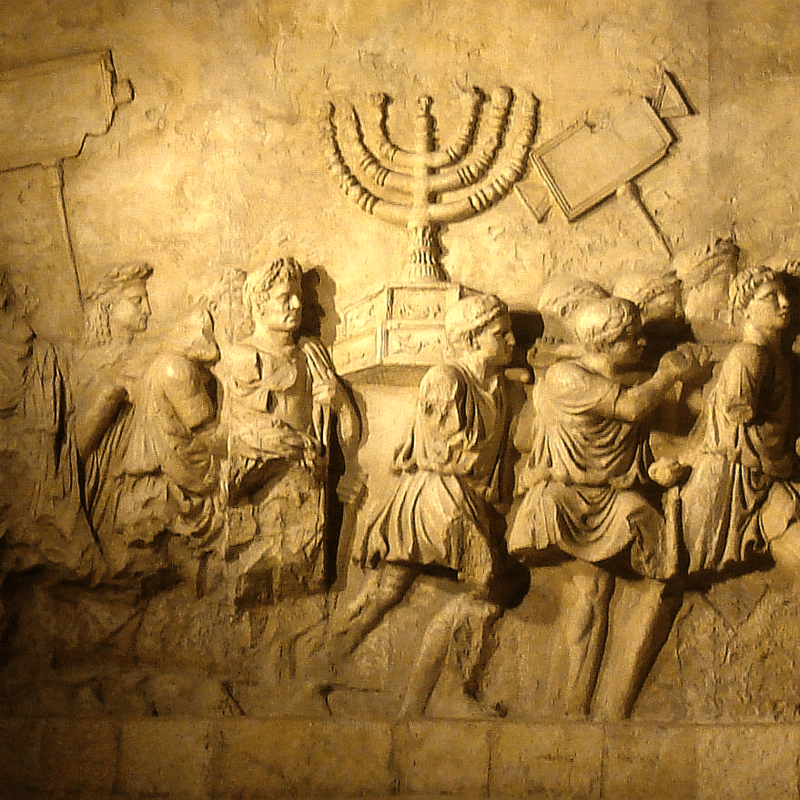 The 2000 year old Arch of Titus celebrates Roman victory over Judea, depicting Jewish prisoners of war carrying Jerusalem Temple treasures into Rome. With the recent UNESCO (United Nations Educational, Scientific, and Cultural Organization!!!) vote denying any Jewish connection to the Western Wall and Temple Mount (Mount Moriah) where the Mosque of Omar and El Aksa Mosques stand today, I’d like to suggest that the supporters of the resolution visit the Arch of Titus situated close by the Coliseum next time they are in Rome. 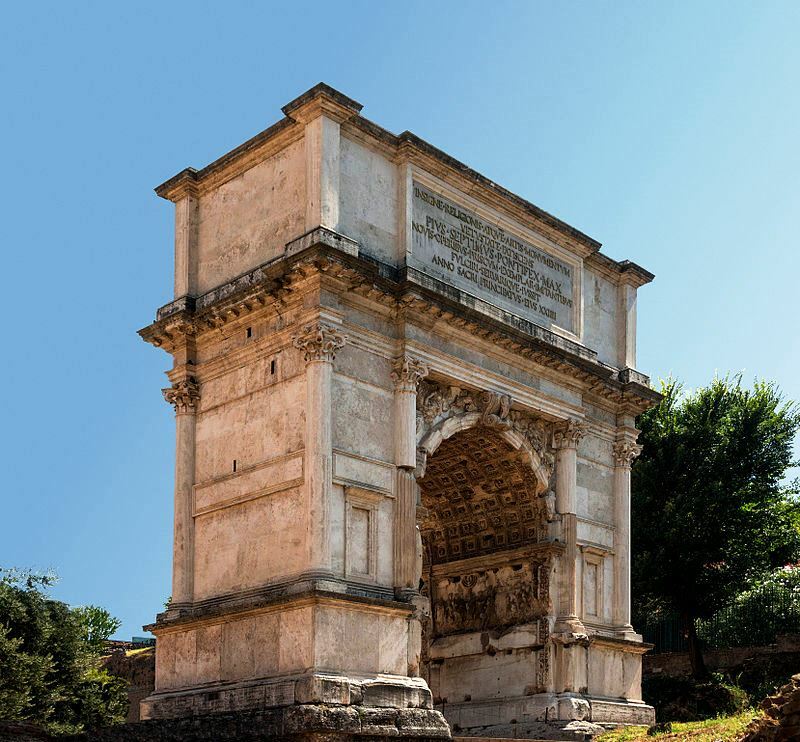 The 2000 year old arch was built to honor Titus who laid siege to Jerusalem in the year 70 A.D. and destroyed the Jewish Holy Temple that stood on Mount Moriah. Depicted on the arch are exiled Jewish prisoners of war carrying the Menorah (seven branched golden candelabrum) into Rome, as well as other Temple treasures such as the Golden Trumpets and Show Bread offering table which was made of acacia wood and covered with gold. The Jewish revolt against Roman tyranny and the attempt to reestablish independence broke out in Caesarea (Mediterranean coast) in 66 A.D. and ended seven years later with the fall of Masada in 73 A.D. The Western Wall is a remnant of the massive support walls that encircled and supported the Temple Mount platform and upon which the Moslems later built the Dome of the Rock mosque, also known as the Mosque of Omar. This entry was posted in Jerusalem, Themes & Traditions and tagged Arch of Titus, Golden Candlestick, Holy Temple, Jerusalem, Menorah, Seven branch golden candelabrum, Temple Mount, western wall by zshavin. Bookmark the permalink.